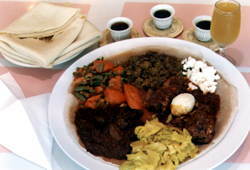 Moya Restaurant in Atlanta has emerged as one of the best Ethiopian restaurants in North America. The decor is uniquely tasteful and original. Old newspaper clippings pasted on the walls on the corridors alone prove to be tastefully done. The food is decidely mildly hot for the non-Ethiopian clientele but spicy enough for everyone's taste. The service is among the finest with even the American employees speaking a very passable Amharic. For those seeking a great atmosphere and a spicy Ethiopian food along with a piano bar and lounge, Moya in Atlanta is a winner. Moya is located in the Emory-Clairmont neighborhood of Atlanta (1371 Clairmont Road, Decatur, Georgia, 404-633-6692). Website. The first thing you notice in this small restaurant is the coziness of the atmosphere. Yes, this is Boulder and they sure believe in a laid-back life-style. But Ras Kassa's gives a new meaning to laid-back when your table (messob) is so close to other diners that you actually start conversing with them. The clientele is of course mostly students and faculty from the university. The climate is one of the best in Ethiopian restaurants around the US. The food? Well, let us say when was the last time you had "hambasha" with "awaze" as an apetizer? It tastes okay but that is improvisation taken too far. The "tibs" could use a little bit of "bite" (add "berbere/awaze" please!). But the atmosphere.....it makes Ras Kassa's a winner. Merkato Restaurant (Fairfax Avenue, Los Angeles). It is often difficult to find a single restaurant where you find the best tibis, shiro-wot, doro-wot, you name it under the same roof. It is the norm than exception to have some restaurants make the best tibis outside our mom's kitchen but fail terribly in some other dishes. This month, the editor of this column picks winners just based on a single dish. Best Shiro-wot. Merkato Restaurant - Los Angeles. When it comes to shiro, Merkato of Los Angeles never fails. There is something about their spices and the freshness of the shiro itself..Think of the rainy season in Ethiopia...sometime in July...it is pouring outside..you are inside your mom's kitchen near the fire-place...Your mom has just fixed you ingocha....and think of the sweet and spicy smell of the shiro on the "gulcha" that goes with it...Merkato's shiro will leave you with that feeling. Fasika Restaurant (Boston, MA). Well, how many Ethiopian restaurants outside the country do claim to have an Ethiopian professional cook with more than 25 years of experience? Your humble editor knows of only Fasika in Boston. Run by a father-son team, Fasika is a small but delightful eatery with some of the best dishes you can find anywhere. The "tibis" has not only the hot and spicy bite but also the right tenderness that makes you ask for more. If you have the stomach for it, the stuffed green-pepper is a must with a shiro or lentils dish. Meskerem Restaurant (New York, NY). One of the oldest Ethiopian restaurants in New York City, Meskerem is best known for its coziness and highly-rated hospitality. Well, this is New York city where its residents and tourists alike indulge themselves in anything "ethnic" and Meskerem does not disappoint. Its vegetarian dishes (shiro, misir wot, alcha and qey kik wot) seem to be favored highly by New Yorkers. Mesqerem's decor, location, diverse and "cool" clientele [web-techies, multimedia artists, new economy workforce and what have you] along with and its long history make it as one of the best-known and successful Ethiopian restaurants in the US. The Ethiopian patrons may find Meskerem's dishes too conservative on the "berbere" and "qbe". But if you have non-Ethiopian friends who want to experience Ethiopian food, Meskerem is the place to take them to. Red Sea Restaurant (San Diego, California). The first thing that impressed the editor of this column was the fact that Red Sea Restaurant was perhaps the first and only Ethiopian restaurant with a its own web-site and domain name. Operated by Shimmelis and Yeshume, a husband and wife team, Red Sea serves some of the finest Ethiopian dishes anywhere. The hot and spicy "awaze" they serve with their "tibs" [or in the "awaze tibs"] is their trademark that will make you beg for more. The decor is modest, the price reasonable, and the service is slow-paced but very polite. If you have a party of 3 or more, the full three-course Ethiopian coffee ceremony is something you can't afford to miss. Coffee, you see, is a serious business in Ethiopia where being treated to a three-course coffee ceremony is one of life's pleasure moments. 1261 W San Carlos St San Jose, CA 95126 Phone (408) 295-9546 Gojo is a name given to Ethiopian traditional home. The secret cooking of Gojo lies in the mixture of exotic Ethiopian spices. 503 W San Carlos St San Jose, CA 95126 Phone (408) 292-2282Welcome to Mudai, San Jose's Ethiopian Restaurant with a wide variety of authentic Ethiopian vegetarian and meat dishes. 1076 S Fairfax Ave Los Angeles, CA 90019 Phone (323) 936-5918 Nyala is a family owned and operated restaurant that has been serving the Los Angeles area since 1988 . 1860 The Alameda San Jose, CA 95126 Phone (408) 294-4313 Sahlu Okbato, who emigrated from his native Ethiopia to the United States in 1991, took over the San Jose Coffee Shop on Aug. 16, 2003, adding Ethiopian food to his offerings in late September. 5200 Claremont Street Oakland, CA 94618 Phone (510) 655-3757 Red Sea Restaurant has been changing the way you eat out for more than 16 years. With eclectic and authentic African Eritrean and Ethiopian food, our restaurant provides you with a completely unique adventure for your taste buds. Zeni Ethiopian Restaurant San Jose, California. Welcome to Zeni Ethiopian Restaurant located in San Jose, California. Ethiopia, located in the Horn of Africa, has one of the oldest and most diverse cultures. Address 2106 18th St NW Washington DC 2009 and Addis Ababa II in Silver Spring MD Address 8233 Fenton St. Addis Ababa, which in Amharic-the official language of Ethiopia- means “New Flower”, is the capital and largest city of Ethiopia. 2447 18th St NW Washington DC Fasika's Ethiopian Restaurant is a land mark at Adams Morgan with 19 years of service and sophistcated menu that features our prix fixe 8 course Ethiopian meal sampler.